By Father John Linden, Director of Vocations and Seminarians for the Diocese of Lansing. We can so easily fall into believing that if things don’t go as we hoped in this world, or if God does not answer prayers for truly good things, that he has somehow forgotten us or has abandoned us. However, Monica refused to believe that God would ever do such a thing. She has left us an example of perseverance in prayer and confidence that all prayer and all of our good efforts matter, even if the outcome is delayed or different than what we may have expected. 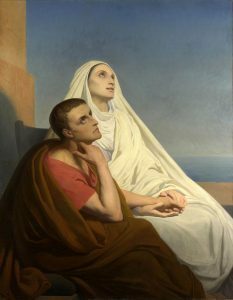 God was always with St. Monica and proved to her in the end that all she had done and had suffered had meaning and purpose. Our lives have the same meaning when we offer everything to God, including our joys and our sorrows. Every minute of your life is precious to God. So often we can look down the road and see a goal in the future, while missing a goal that is present to us now in the work that God is doing. Even if we can’t yet see or understand this present goal or the meaning of our waiting for our future goals, we can have faith that God is always doing something that is very good. He is with you now and everything that you are and everything that you do now has meaning and purpose even in light of your future desires. Many of the struggles of the present can bring tears, but those tears will never be in vain which are offered out of love for Jesus who is the Joy of our souls. Monica loved her son and her husband who were the joy of her soul and in the end her wayward men found the Lord in answer to her many tears. In fact, it seems God never missed counting even one tear if we think about what kind of saint her son became and how indebted we are to God for the work he did through Augustine. But that work may have had more to do with St. Monica’s tears than it did with St. Augustine’s study.